Illustrations: 9 b/w illustrations and 4 maps. The once arid valleys and isolated coastal plains of California are today the center of fruit production in the United States. Steven Stoll explains how a class of capitalist farmers made California the nation's leading producer of fruit and created the first industrial countryside in America. 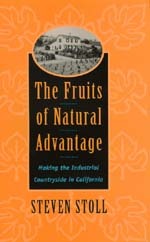 This brilliant portrayal of California from 1880 to 1930 traces the origins, evolution, and implications of the fruit industry while providing a window through which to view the entire history of California. Stoll shows how California growers assembled chemicals, corporations, and political influence to bring the most perishable products from the most distant state to the great urban markets of North America. But what began as a compromise between a beneficent environment and intensive cultivation ultimately became threatening to the soil and exploitative of the people who worked it. Invoking history, economics, sociology, agriculture, and environmental studies, Stoll traces the often tragic repercussions of fruit farming and shows how central this story is to the development of the industrial countryside in the twentieth century. Steven Stoll is Assistant Professor of History at Yale University.